Posted May 10, 2018 by Eds. 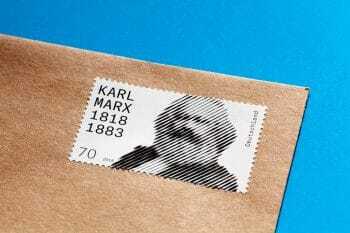 The German postal service has released a postage stamp, designed by visual artist Thomas Mayfried, to commemorate the 200th birthday of Karl Marx. The design was the winner of a competition run by the German Federal Ministry of Finance to create a stamp to celebrate the anniversary of Marx’s birth on the 5 May 1828. 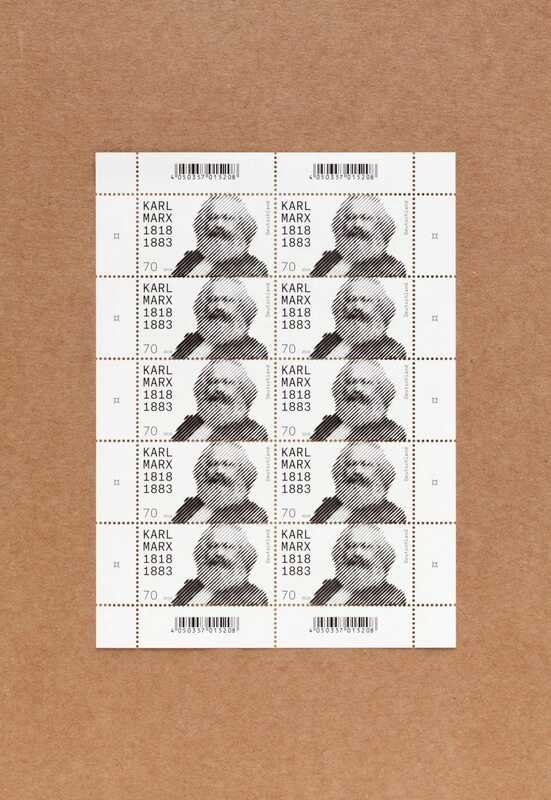 The stamp is now available from the German postal service – Deutschen Post. Designed by Thomas Mayfried, the winning stamp was chosen by Germany’s art advisory council and features an abstract portrait of the theorist in black and white. 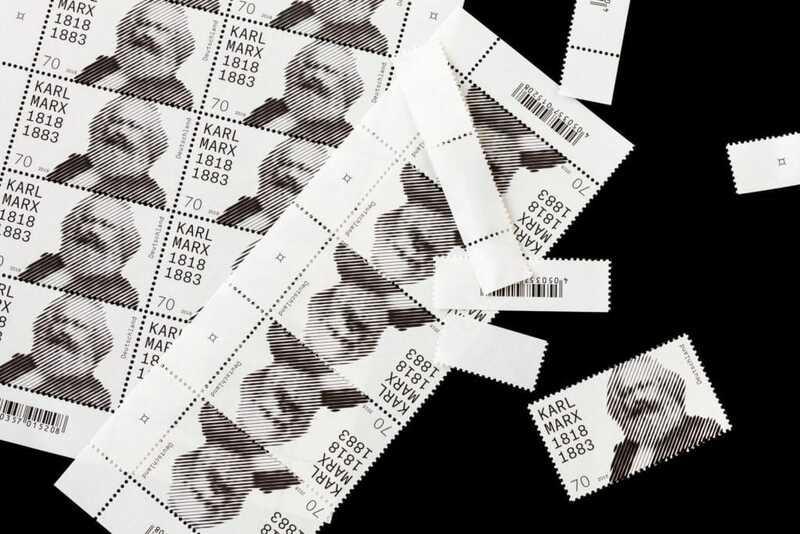 “Marx’s critiques of capitalism became the basis of virtually all social democratic, socialist and communist movements in the world,” said the German Federal Ministry of Finance. “After the 1989 and 1990 collapse of the communist regimes in Eastern Europe, Marxism seemed to be at its end. 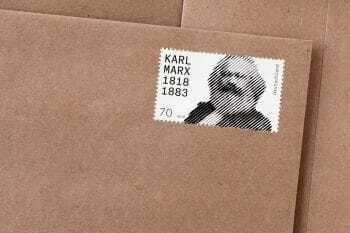 Yet in the wake of the 2008 financial crisis, Karl Marx has attracted renewed and international attention,” it explained. Although many of his predictions have been obviated by historical developments, his analysis of national and global contexts of capitalism remains pertinent. Mayfried, who is based in Munich, created the stamp using a now iconic photograph of Marx taken in 1875 by English photographer John Mayall. Described by German philosopher Fredrich Engels as “completely in his cheerful, victorious Olympian peace”, the image depicts Marx in portrait form, facing the camera from a side angle. Mayfried reworked the image by printing it in a series of black and white lines. “The idea is to escape the heroic context and at the same time allow a contemporary interpretation,” he explained. The design also includes Marx’s name in a Sans Serif font, as well as the years of his birth and death. According to the ministry, this is the first time that the German economist has been portrayed in black and white. 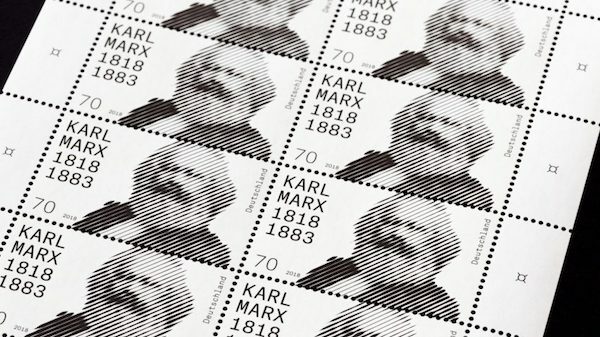 Previous stamps have depicted the writer of the Communist Manifesto with a red background – a colour associated with Marxism. “Through a thick grid of black and white lines, Thomas Mayfried abstracts what is probably the most frequently reproduced portrait of Marx,” said the ministry. 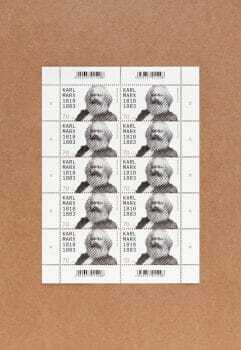 Stamps are often used to celebrate the lives of important figures. Last year in the UK, the Royal Mail released a series of stamps featuring six of David Bowie’s most iconic album covers, while the Iraqi postal service paid tribute to Zaha Hadid by featuring her on a new stamp.